Micro-JITIFA projects are written, published and managed by the initiators themselves. Initiators learn IT skills, writing and managing by publishing projects whether their projects succeed or not. Trust is acquired by starting small projects that are easily verified and by being transparent and maintaining contact via internet on a personal basis. Friends vouch for the initiators and promote their projects to their own circle of friends who then collaborate to help fund small projects by each donating small amounts. With time, enough friendship and trust is acquired to make subsequent projects easier to succeed. When I close my project, I will write a report of its success or failure. 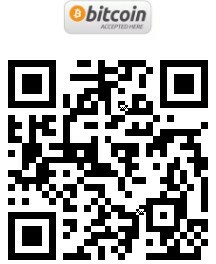 I will provide a scan of all receipts with an account of how I used the donations. I will not delete this post, but use it as a reference for any future Micro-JITIFA projects. My name is Alasana Camara. This is my second Micro-JITIFA project. 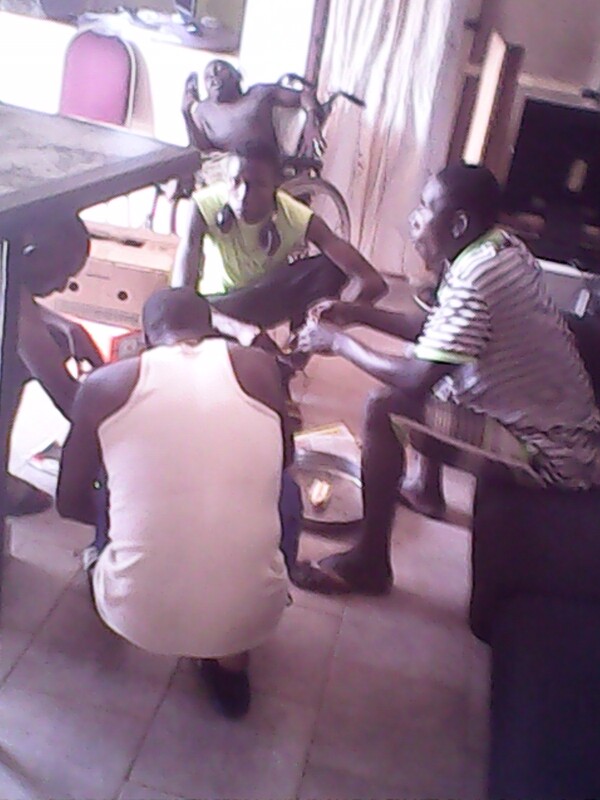 I attend Ebrima Skill Center in Gambia, Africa. 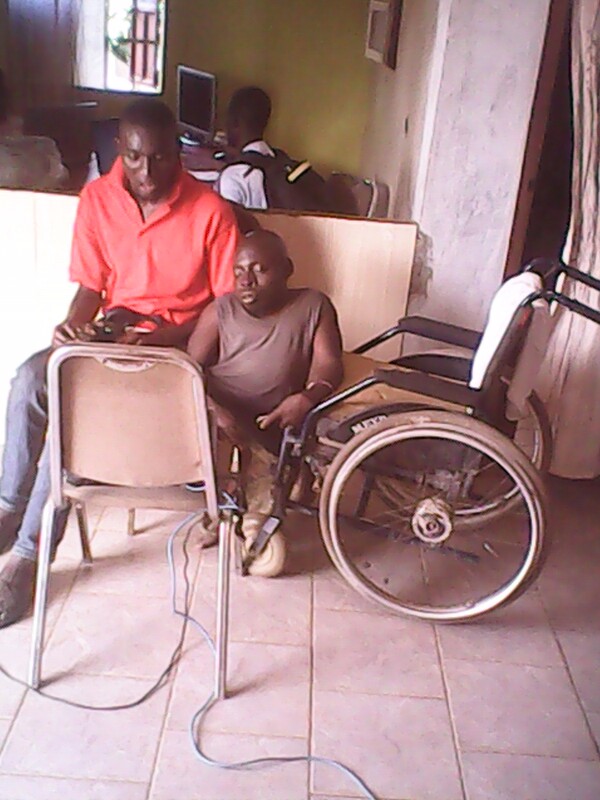 This is a school for disabled students that was started by Mr Hydara in 2016. He teaches, feeds, clothes, and accommodates 3 students at present. He has one teacher to help him teach who at present is working on a part time voluntary basis as he is studying himself at the teachers collage nearby. Mr Hydara is in the process of registering his school as a non-profit organization, and he depends fully on donations to run his school. In my first Micro-JITIFA project, I was able to get enough donations to help me pay for my 2017 school fees and school expenses. In this second Micro-JITIFA project, I would like to collect enough donations to help pay for the 3 meals that Mr Hydara provides for me every day. You can find more about me in my previous post. There you will also find character references and a reference letter from my school, information about my school - the EBRIMA SKILL CENTER. my concluding report on the successful completion of my last Micro-JITIFA project and a report by the principal Mr Hydara. Here is our cook she is preparing a food. before to the cooking pot she did preparation when from the market to gather all the spices and the food stocks that she will cook, here she is on that preparation in he Chechen. Cooking with gas and wood. 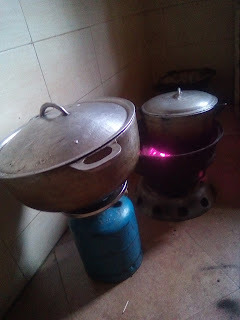 When she is done with the preparation of spices, usually she born fire on the gas or wood for cooking and then put the cooking pots on the fire for cooking here are the cooking pots. This are the food stock Mr Hydara and Mr Drammeh bought at the market today,through the advanced donation that has been donated for my school meals. 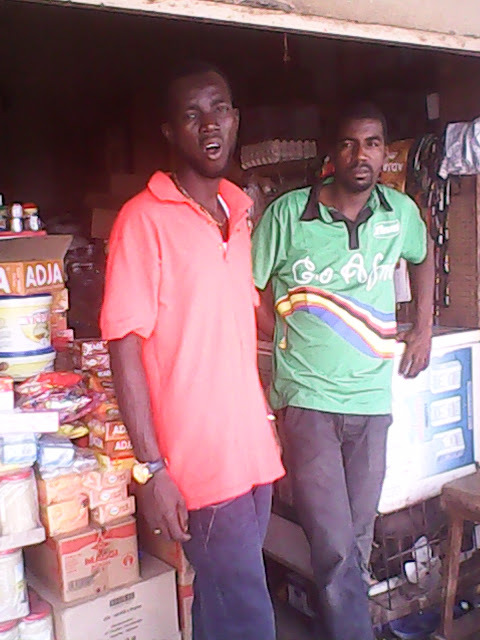 Mr Hydara and the shop keeper were they do bought those food stock. The wheelbarrow driver for the transportation of the food stocks from the market to the skill center. The orphan childrens eating with Mr Hydara for lunch. An orphans boys eating too for lunch . I have to eat three times a Day in the school usually with my teachers and my fellow students, In the morning we have to eat a cup of tea, milk, and a bread that is for breakfast. Lunch time I eat rice with fish or meat when I have a soft drink flavor like orange I like to take after having my lunch. For dinner I love to have beans with chicken that is what I love to enjoy for dinner when I have, and it is my favorite food. There is a food I like the most some time Mr Hydara do bought it for me from the mini market called Pizza I wish to have that food every day but is expensive Mr Hydara cannot afford it every time for me. My family is poor feeding is their problem at home, sometime we have sometime not, at my home we only eat rice every day because that is only food they can afford, and in the school I thanks God that things are different and they make responsibility so light for my family, I now do every thing in the school Mr Hydara is responsible for every thing. I do take my food in different times, for breakfast 9:00am in the morning, lunch 3:00pm in the afternoon and for dinner 9:00pm in the evening. We eat salads very rarely because it is too expensive. But Mr Hydara eventually plans to grow a garden and start to grow some sprouts. Having a garden at home is not too common as most people lack the necessary space to have gardens. 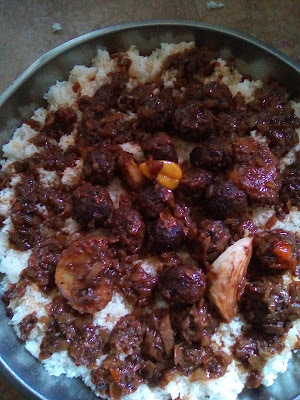 Our food is very spicy with baharat, black pepper,cinnamon, cloves, leaf and hot pepper. We eat bread every day, but we do not bake it ourselves. very few people bake their own bread because the fuel to bake it is too expensive. We started with prayer before taking our food we do it collectively, and after eating I do brush my mouth with clean water from the well, unfortunately we have no tap in our skill center, we boiled the water from the well before drinking sometime we used tap water from the neighborhood. 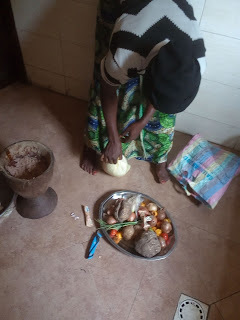 I feel sometime to help with cooking but i cannot at this moment Mr Hydara usually do help the cook going to market for her washing basin for her and some time cooking as well. Mr Hydara he is a active person when come to helping people. I do love to enjoy local grown fruit and vegetable like banana, orange, mango, salad,cucumber and tomato, sometime is hard to have food like eggs, yogurt and wheeze but I really do love and enjoy them when eating. I feed 13 people every day. 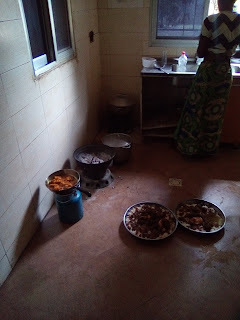 The regulars include 3 students, 2 teachers, 1 cleaner, 1 cook and 6 orphans. 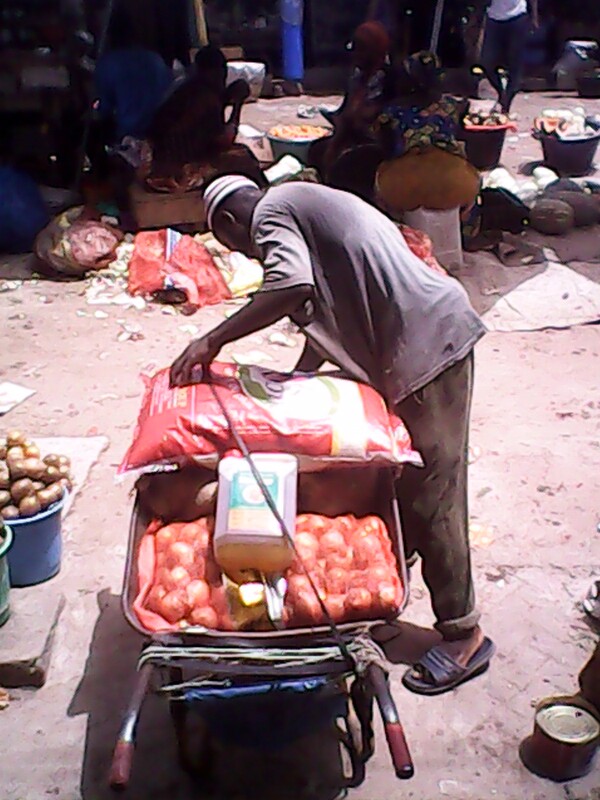 When I go to the market 2 miles away to buy food stock I take the donkey-cart for transportation. 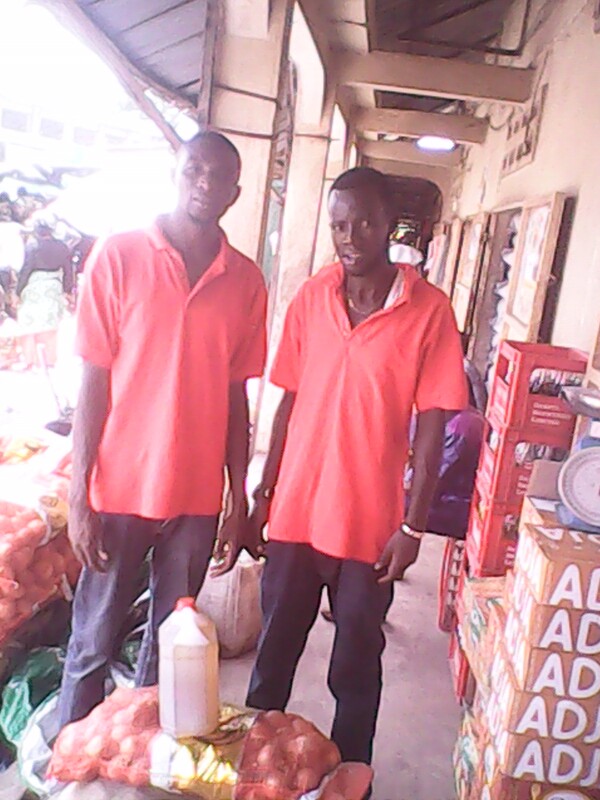 I struggled with the help of God to sustain my students and teachers by providing them food. Some of the food is donated and I use all money donated to buying food. 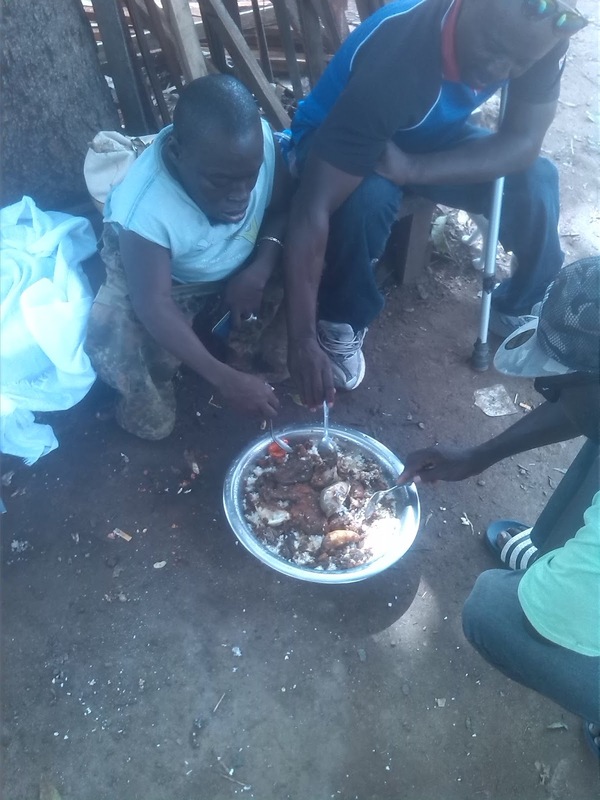 Sometimes when donations are low, it is hard for me to give them something to eat, but I thanks God for the help from good people. At the place where my skill center is located there is a woman living inside the other apartment with her family and she helps by cooking for us and donating food. She is also a good supporter of my vision. She plays a major role on that area, she do help us for the sake of God I am proud of her gesture for supporting us. She usually cooks with firewood which is less expensive than gas. When there is gas we do cooking with gas for breakfast and dinner. This list below is the menu of the meals that I normally try to offer every day. For breakfast we have tea, and bread with milk and beans. For morning snack we have fruit. For lunch we have rice with fish or chicken. For afternoon snack we have fruit, cake and soft drink,. For dinner we have vegetables with beans, chicken and bread. For evening snack, we have biscuit, cake and soft drink. As explained in the Micro-JITIFA description, mentors play a very important role in a Micro-JITIFA project to ensure its successes. 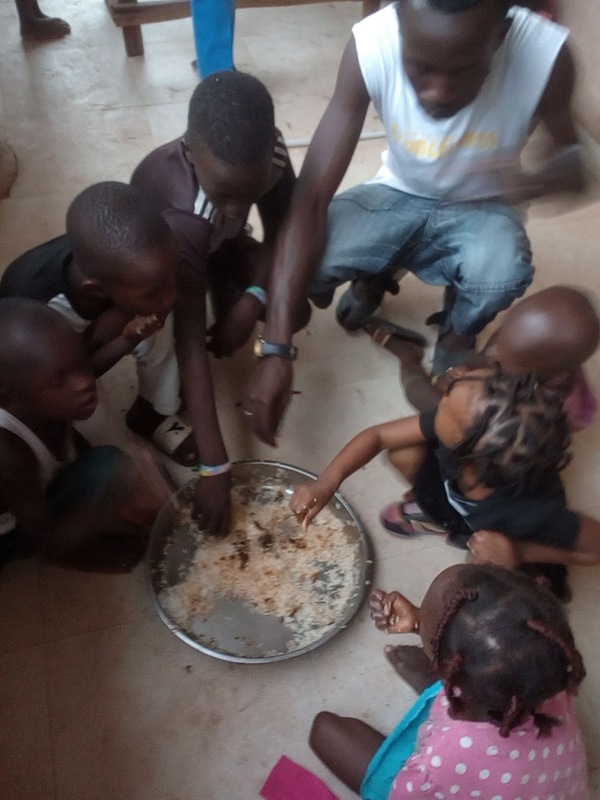 I have learned a great deal mentoring this project about the Gambian cuisine and in verifying that the meals served at the Ebrima Skill center are adequate. It is the role of mentors to awaken interest and knowledge and awareness. In this project I have tried to do that regarding diet to both the people being helped and to the people helping. 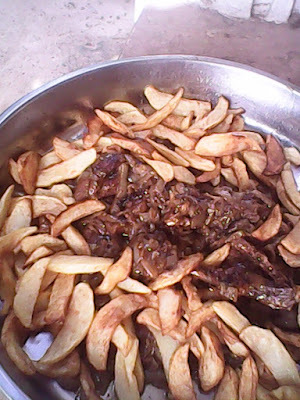 The Ebrima Skill Center offers typical local dishes. 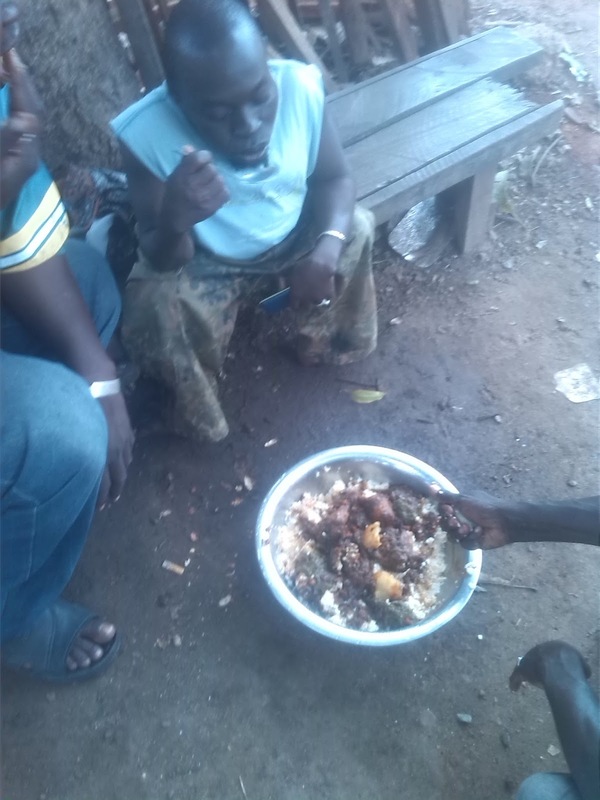 But as Alasana points out, there are too many poor people who can only afford to eat mainly rice. Alasana in respect is lucky to be fed by Mr Hydara, rather than to be fed at home. Taking information from Mr Hydara, I have made 2 tables listing the foods he normally buys, the amount that he SHOULD buy when he has enough money so that the daily recommended dietary allowances are met to ensure a healthy diet for those he feeds. 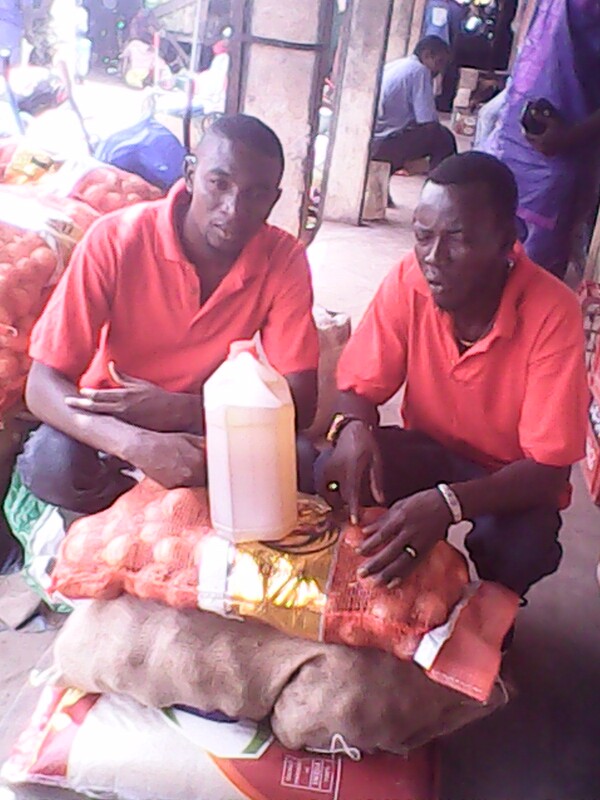 The tables also list the typical costs of foods in Gambian market as obtained from the internet. The amount of food Mr Hydara stocks his school kitchen varies with the amount of donations he gets and the amount of food people donate. 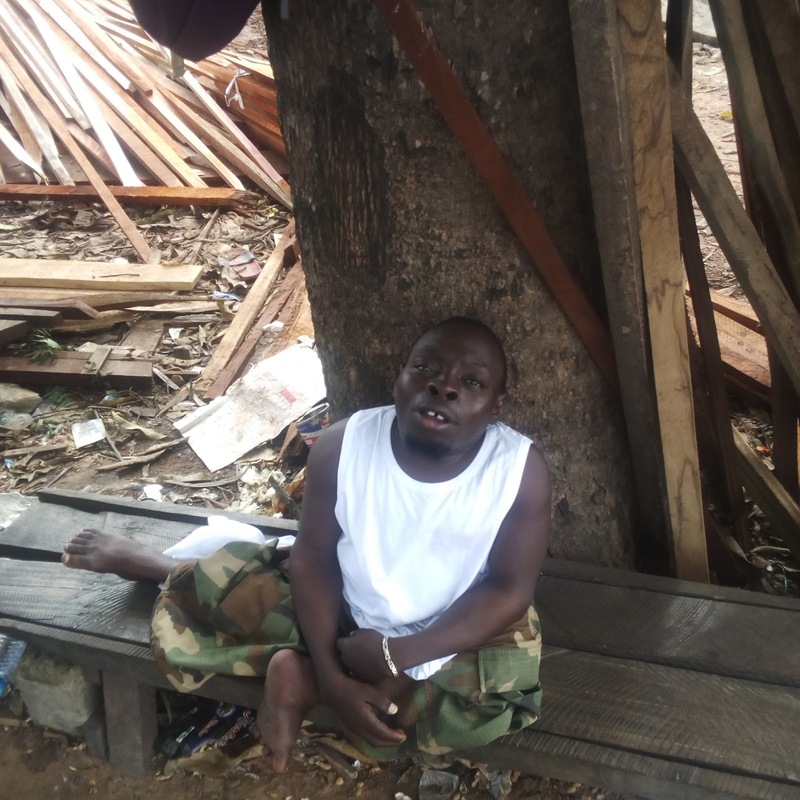 He uses all of his donated money to buy food, fuel, and to charge his batteries to power his school equipment. Taking information from the internet, I have made 2 tables showing the nutritional data of these foods, and the amount needed to meet Alasana`s daily recommended dietary allowances to ensure a healthy diet. It is my greatest hope that this analysis that I made using Mr Hydara`s data will be useful to Mr Hydara and that next year when Alasana make his Micro-JITIFA project to help pay for his 2018 school meals, Mr Hydara will be able to include some changes to Ebrima Skill Center meals, such as home-made yogurt, home grown sprouts, and school grown fresh vegetables from his school yard garden and perhaps even a few egg laying chickens. Table 1 and Table 2 show the various foods Mr Hydara tries to provide for his school meals with the donations he gets, how much he has to pay to buy them and the costs per person / day. To feed 13 people for 1 month, Mr Hydara needs $22.10 per day or $663 per month. The following links were used for the data. Table 3 and Table 4 show the nutritional data of the foods the Alasana gets when Mr Hydara has enough donations to stock his kitchen. Recommender daily amount for a 15 year old boy with a sedentary activity level. Recommended amount of sugar is 6 to 9 teaspoons, or 25 to 37.5 grams, of sugar a day. Pledge a donation. Please email me your pledge to ibrahimhydara1@gmail.com I will inform you once enough pledges for my project are reached so that you can donate using the various options below. You will get a 10 digit transaction number (MTCN) that you must email Ebrima Hydara to yahayambya@gmail.com so that he can pick up the money in a few hours at any nearby Western Union office. Share and promote this Blog to your circle of friends. Request your friends to pledge, donate, share and promote this Blog to their circle of friends. The costs of providing 3 nutritional meals each day for me is only $2.35 / day. This is $70.50 / month and only $846 for an entire year. Adding a fee of 8% charged by GoFundMe and a further 2% fee for transferring and exchanging currencies, the funds I need are $931 or CHF 900. Please use the Comment field below to ask me any questions and feedback.i will try to answer all your questions within a week.you can also use COMMENT field to meet and communicate with the fellow collaborators that are helping me promote my project and / or donating to it.